Yesterday I had some serious technical difficulties (stupid Blogger keeps breaking my links) but all the links in Merrick's post are now functional. Sorry about that. Go check out her blog! There have been a couple questions on how exactly to do this, so here's a quick and easy rundown. Before we start, let's talk knits. Sewing with knits is a little more difficult than with woven fabrics but NOT to the point where you have to be all experienced to handle them, so don't let them scare you off. I love sewing with knits because they're really forgiving and you can get away without hemming them (hemming = evil and swear words). 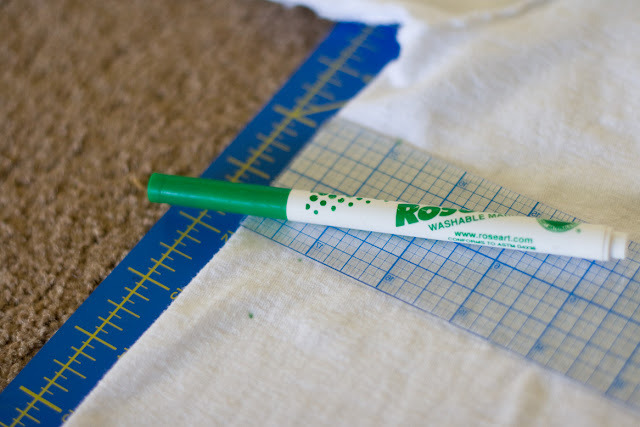 First, you'll want to see if your machine has a stretch stitch. I didn't know mine did until I finally got around to reading my manual (about 2 years after I got my machine. Better late than never). If it doesn't then you can use a zig zag stitch, but your stitch needs to have some give so that it doesn't break when the fabric stretches. Your average straight stitch won't hack it. Second, you might want to consider grabbing some ball point needles. They're specifically for sewing with knits and they do make a difference so it's probably worth the couple bucks they'll set you back. Ok, so get your shirt, turn it inside out and lay it flat. 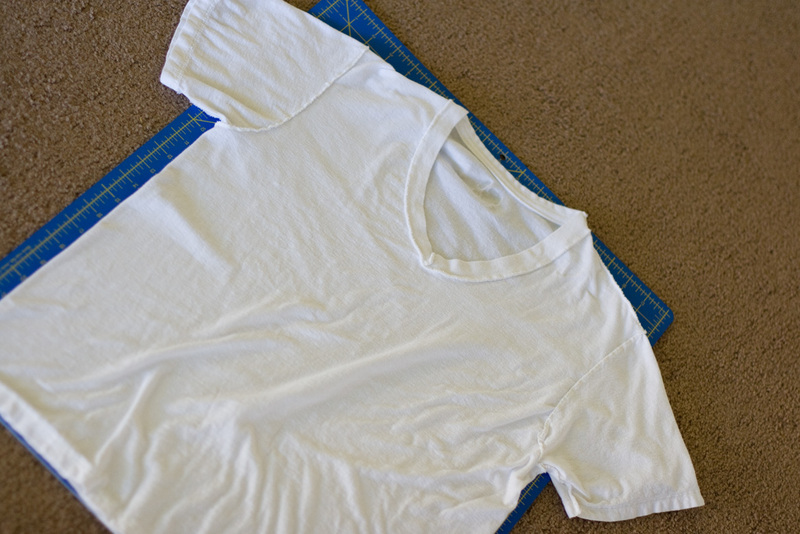 Grab a shirt that fits you well and lay it on top to get an idea of how much you want to take off the sides. Or you can always put it on and pinch the extra fabric and gauge it that way. I knew from last time that I wanted to take off an inch from each side, including the arms (I have weirdly skinny arms, so check the fit around your arms before deciding how much to take off). Grab a ruler and a WASHABLE marker. I do actually have a fabric marking pen but can only find it about 50% of the time. When it's MIA I grab one of Stinky's markers and it always works just fine. I made dots 1 inch in all the way up the sides and down the arms. You can pin if you want. Sometimes I do, sometimes I live on the edge. Now just play connect the dots with your sewing machine. 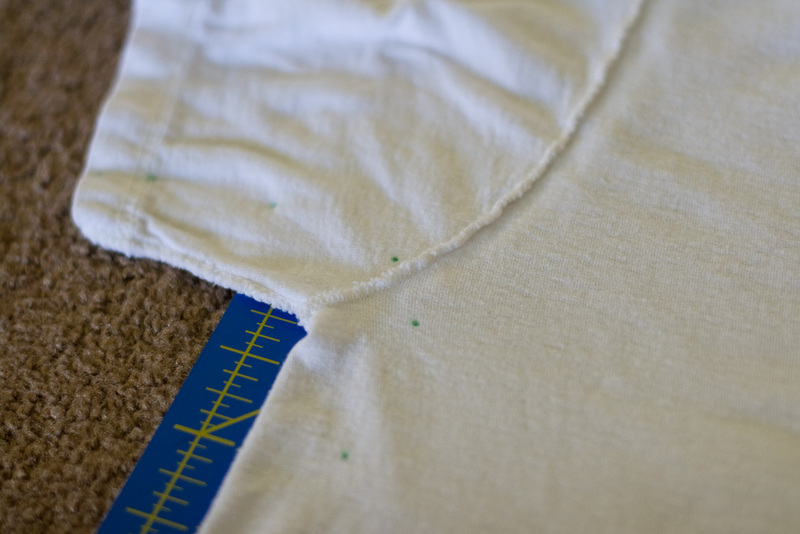 Since knits don't fray I trim the seam allowance pretty close, like 3/8 inch. If you leave yours bigger you'll probably need to clip the seam allowance in the arm pit a bit to allow for ease of movement. And that's it! Skinnified t-shirt. Questions? I always wondered if it was OK to do that! Just to sew down and pull shirts in. I'll have to try it! 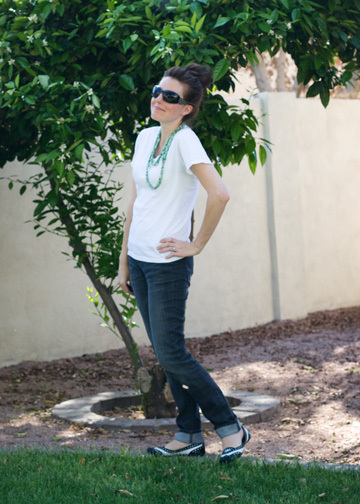 your shirt looks awesome...and i seriously never thought of "skinnifying" my own. you are a GENIUS! must do. hmm... I guess I'll try it and then figure out if I understand the instructions. :) Sound easy, which makes me skeptical! Oh good idea! I never thought about doing that although I have a few random too big shirts :) Thanks! That's an awesome idea! I know I have a few shirts that could use some skinnification! I saw you over on Momma Go Round and wanted to say hi! Love your blog!